What kind of paper do you want? We have white, off-white, champagne (a pale peach color) and ivory. 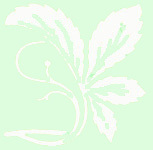 It is difficult to show samples on a website. Variations in monitors give variations in color from the actual paper. We are always happy to send out paper samples. If you would like samples, let us know in an email and send us your address. The white and off-white papers show the watercolors best. The white is a soft white. Many people like the ivory or champagne because they look "old fashioned" or go with the wedding's color scheme. New! 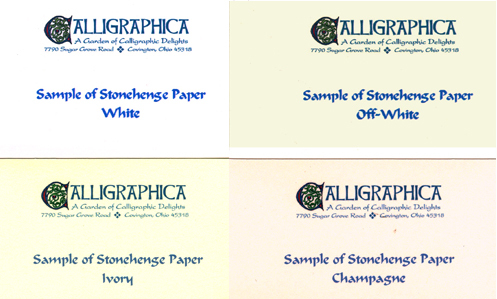 We also have a light blue Stonehenge paper. All of our papers are acid free fine art papers. These are professional grade heavy weight papers made for watercolor, pen and ink and printmaking. Our standard size is 22" x 30". That may seem large, but if you need room for 100 to 150 guests to sign, plus your vows, date, names and decoration, it will all fit and not look crowded. We have paper large enough to accommodate as many as 350 guest signatures, up to 30" x 44". These are available in white or off-white only. Please note that some of our older certificates were done on a parchment style paper. While this looks very nice we had trouble with the lettering ink "spreading" on the paper and the lettering looked too thick. Sorry, but we no longer offer the parchment. If your certificate has fewer words and less than 50 witnesses, the 22" x 30" paper could be trimmed down a bit. Also all printed certificates could be reduced in size if you prefer. We like to keep decoration, text and signature area in proportion so your certificate will look good framed and hanging on your wall.